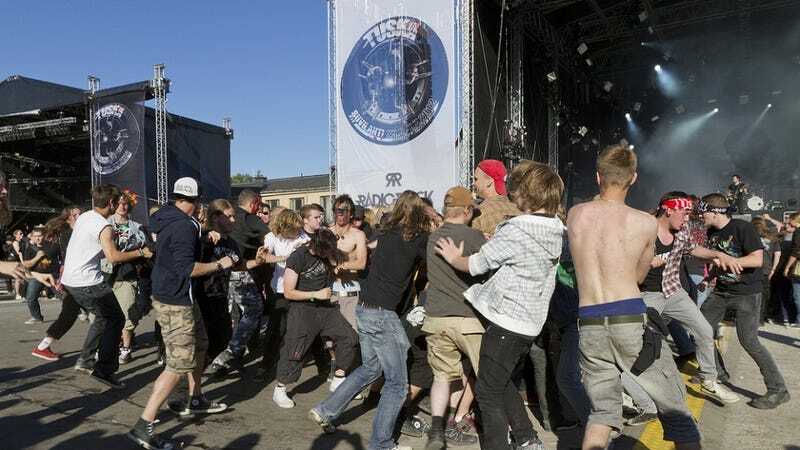 Despite their chaotic appearance, mosh pits operate according to an unspoken set of common rules that propagate these spontaneous social systems. Without rules and a common cause, however, the pit becomes little more than a sweaty mob set to music. Similar "mob rules" are actually found throughout nature wherever animals congregate—numerous individual actions indirectly affect and direct the those of the group as whole. This native group discipline is what keeps schools of anchovies from dispersing in a panic at the first sight of a predator and keeps herds of hyperactive teens churning as they pummel one another. This is precisely the notion that occurred to Cornell physics grad student/head banger Jesse Silverberg when he recently took his girlfriend to a metal show. With the help of fellow grad students, Matthew Bierbaum and James Sethna, Silverberg first studied film of pits in action and, from there, developed the Moshpits Simulator. This interactive model pits a contingent of red Mobile Active Simulated Humanoids (MASHer) against a larger group of benign, non-moshing audience members. By adjusting such variables as the size of the arena or the size of the crowd, Silverberg's team can accurately predict the group's behavior.